A publishing executive said that a few years ago, dismissing Michael Moorcock as an author who could connect with today's audiences. It was an off-hand apocalyptic remark, the kind of overreach that people make when they're worried about their jobs. The next night, Mike had heard about it, and he started laughing. "They've said that at least four or five times over the course of my career," he replied. "They've left me for dead and I've always outlasted them. That's what you do, you know. And in the end, I'm still here -- and they're out of work. It's the way of things." He said it gracefully, like someone who had been there, done that, several times over. No bragging. No malice. No sweat. Just smooth. When times are tough, I replay that moment in my head. It was a gentle career lesson delivered in a few killer sentences, wrapped in a smile. 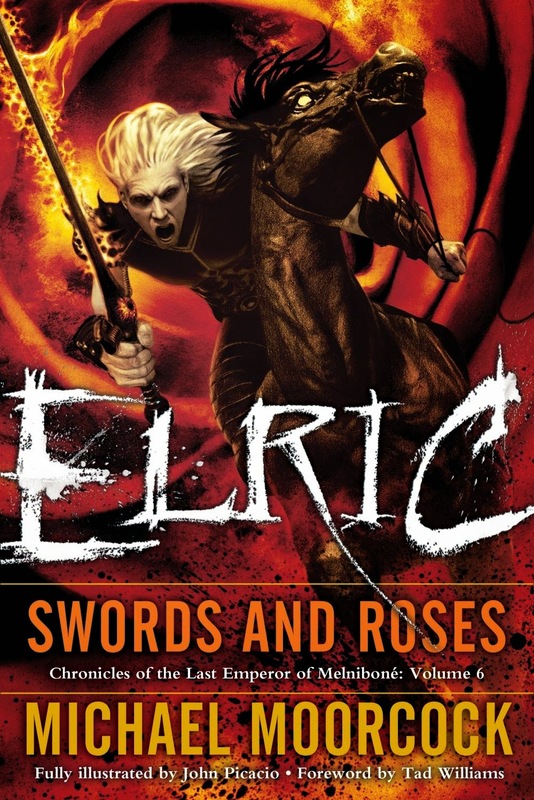 Mike was the first author that I ever cover-illustrated, and I've been fortunate to illustrate several of his works, including major editions of the Elric of Melnibone saga for Random House. He's the one that taught me how to be a pro, usually without even trying, sometimes without saying a word. He owns the career that we all hope to have, the one that has multiple lives and new possibilities for the world, the one that shapes change instead of gravytraining it, the one that celebrates all we can be. 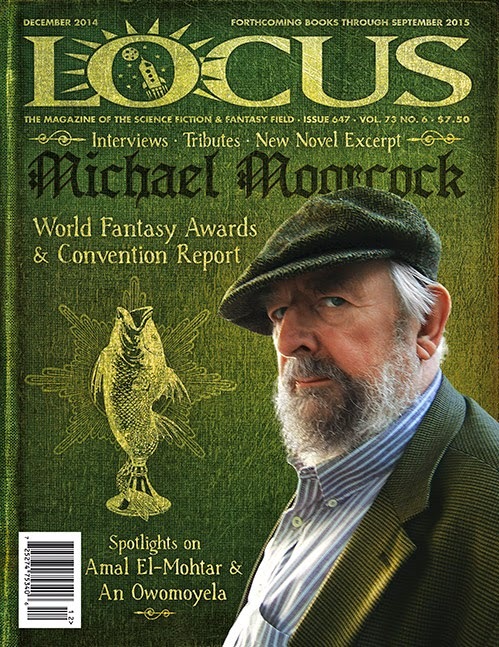 Locus Magazine's December issue celebrates Mike's 75th birthday and with it, his prodigious career as one of The London Times' "50 Greatest British Writers Since 1945." He's widely regarded as one of the most impactful creators in the history of science fiction and fantasy, and quite frankly, that's an understatement. If you haven't bought that issue yet -- grab it. I think you'll find it well worth your time -- and if you've never read a Moorcock book, it's a welcome compass for navigating his literary landscape in search of the right work for you. He's a must-read for anyone who loves fantasy literature. In an age driven by social media and the perception of followers -- Moorcock's all-time 'follower' list includes legendary careers that were directly spawned by his authored works and editorial tastes: Brian Aldiss, J.G. Ballard, Samuel R. Delany, Thomas M. Disch, Harlan Ellison, Norman Spinrad, Michael Butterworth, John Sladek, and so many more. If you're a fan of the works of Alan Moore, Jeff Vandermeer, China Mieville, Grant Morrison, Graham Joyce, Chris Roberson, Tad Williams, Paul Cornell or Neil Gaiman (see Neil's terrific story, "One Life Furnished in Early Moorcock"), he's a fundamental wellspring of inspiration for all of them, and legions of creators from around the world. His imagination and influence weave through the history of gaming, fantasy art, rock music, comic books, and filmmaking over the last 50 years to the present -- thanks to concepts, characters, narrative devices, and archetypes he conceived which others expand upon, or imitate, often without knowing he was there first. I can't wait until his new book releases in January from Tor. It's a fantasy novel called The Whispering Swarm, and it's part personal memory, part history of London. I'll buy it the first day it releases, and start reading that night. Whatever I'm illustrating that day, I suspect reading The Whispering Swarm will challenge me to be better at what I'm doing, and inspire the hell out of me, as all great works and great people do. Cheers, Mike. Happy 75th. I hope it's a terrific birthday week for you, and that you and Linda celebrate and enjoy all of the best. Happy Birthday to a living legend. The man who gave us Elric and Jerry Cornelius. Who gave us New Worlds and the first chance to see Aldiss, Ballard, and so many more. They should make Moorcock's birthday an official holiday. Loved that character, one of my favorites. Alamo City Comic Con 2014: What Next? Alamo City Comic Con Print Sale!